The insurance industry in Asia is changing – and we are changing with it. In addition to Asia Insurance Review magazine, the voice of the insurance industry, subscribers will be able to access another, deeper level of insight and intelligence on this fast moving sector. It is called AIR+ and it brings you more news, more analysis, more insights – a premium product for executives at the cutting edge of the insurance sector. Over 40 articles per month to provide a deeper perspective across the entire breadth of issues shaping the insurance industry. Important and exclusive interviews with C-suite decision makers to provide you with unrivalled insights and the information that matters most. Reactions and responses to key market developments. Conference reports of major industry events within the week. Access to white papers and research reports. Exclusive excess to video interviews with C-suite executives and analysts. Infographics covering timely insurance industry issues. From the archive – a look back at poignant articles from Asia Insurance Review’s 27-year back catalogue. What is the difference between AIR in print and AIR+? AIR in print is your trusted monthly magazine – published continuously for the past 27 years. AIR+ is the daily premium content you can read on top of your monthly magazine content for extra behind the scenes insights, commentary and news. If you have a print subscription or a Digital Only subscription to Asia Insurance Review, AIR+ will provide you extra content in addition to your subscription content. You get the best of both worlds. Is the AIR+ content free? No. Since it is premium content, it requires a subscription. If I subscribe to AIR+, will I need AIR Print? 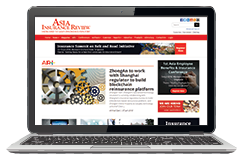 You may subscribe to Asia Insurance Review’s Corporate subscription or Print +Digital subscription or Digital only subscription to read the magazine content as well as the premium content from AIR+. I am a subscriber to Asia Insurance Review. How do I read the AIR+ content? How do I subscribe to Asia Insurance Review and read AIR+?